What can we do too get back a tournament? Convince TWL that enough teams will participate so it is worth the effort. How many teams will sign up? Who already said they will do it for sure? Give them a good reason to start it. And bring forth that we have people that would be willing to step up as AA2 TWL admins. I'd be willing to step up, having experience from ESL and HTGN as admin and match arranger. All they need to do is start a leauge, the rest will the community take care of. And no CDC, for the love of god. 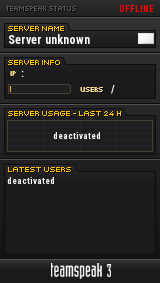 People have enough problem joining servers as it is with tournement mode and Unautorized username kicks. CDC, for people who haven't used it; is the worst 3rd party anti cheat program to ever have been used in a game, period. It catches people from time to time, sure and prevent people. Or atleast did, but it's alot of managing and fixing before getting it to work, something people wouldn't handle today. I'm sure of it. there are planny enough clans . Plenty of them are there only to pub (no offence), to have fun with eachother on teamspeak with no competition ! I feel going through TWL will just be a waste of time, as sergio said, It would be better for us to have our own set up. FLC is a good start for this. In the FLC, some teams scrim for the first time to se if they like it or not. It's not a big challenge to play against them, but it's always cool to see more teams in the current competition! Ugh, TWL blows, always has, always will. Why not do it through Assist? I mean, seriously, we're donating and stuff to this cause, which shows we trust the leadership and what they've done here. So why shouldn't we trust them to do this? I believe it's not about trust, but rather the fact that Assist devs don't have the time to manage such a thing. I definitely get that angle, and I was rather vague. So we generally love what they've done here -- kept the game we love alive, even updated it (and even continually update it), fixed stuff, added stuff, and then created an official community for it, among other things. The structure, around which this whole thing is formulated, is sufficient enough -- and perhaps even efficient enough -- to handle an official league. The Devs don't have to administer the leagues necessarily. Picking league managers and administrators could be a vote-designated thing, considering we have 'community' built directly into the Assist program, in addition to these forums. If people throw their proverbial 'hat into the ring,' an initial screening of the candidates (based on whatever criteria) can be administered by Assist folks (if need-be), and then a community vote could decide the appointments of the potential league's operators.